As well as running a media network Splashpress Media also offers a range of media services including PR & marketing for tech firms looking for exposure. Over the years we have worked with a variety of firms including major IT firms & telecoms as well as getting our content featured on major media sites such as Mashable. Towards the end of 2014 we did some coverage for an excellent billing software for SME’s and freelancers called Hiveage on Freelancewritinggigs.com. The team at Vesess behind Hiveage just launched a new SaaS in the autumn and decided to ask us to help them get the word out and we were more than happy to oblige! Vesess’ new venture is a service to help traditional taxi firms in the Asia Pacific region compete with the new players such as Uber, Grab Taxi and Ola that have moved quickly into their territories in the last few years and are starting to dominate the industry. Many of these traditional transport & logistics firms lack the infrastructure to compete but Vesess’ new SaaS Vgo helps them move up to the next level and compete with these behemoths. “Local taxi operators are threatened by companies like Uber and Ola — mainly due to the convenience that they provide. 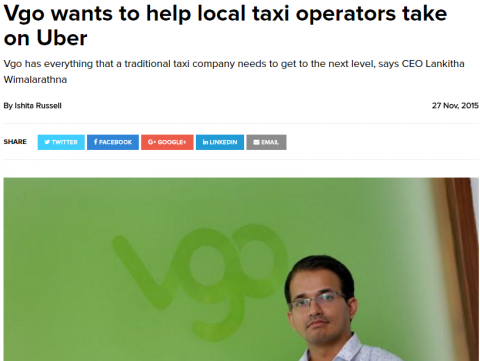 Vgo has everything that a traditional taxi company needs to move on to the next level,” says the CEO & founder Lankitha Wimalarathna and co-founder and creative director Prabhath Sirisena in an interview we arranged for them in e27. Tech In Asia were also very keen to speak to Lankitha and Prabhath about Vgo and also to learn more about the Vesess story and how they built the company up from just a small web development company over the space off 11 years. Vgo received $1 million in VC seed funding and they are already operating in Sri Lanka, India, Malaysia and Australia and have their sights set on the US market in the future so you can expect to be hearing a lot more about them in the future.